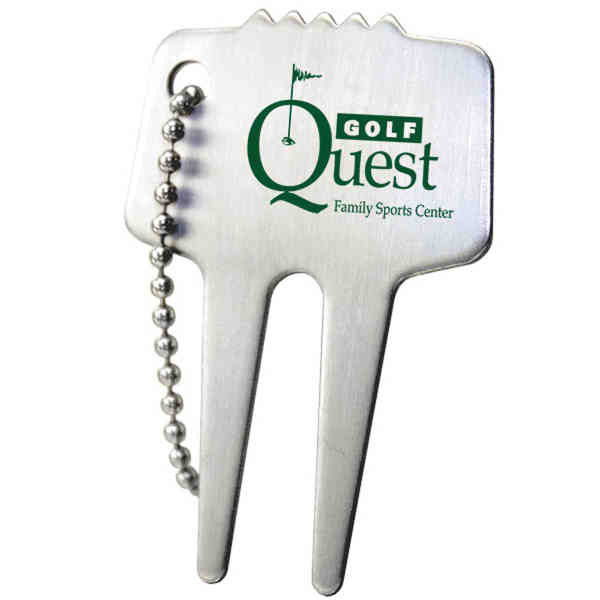 Fix your advertising lull while you help clients fix the holes in their game with this steel divot tool with chain! Measuring 1 1/2" x 2 1/4", it's made of stainless steel and can be customized with your name, logo or marketing message before you hand it out to help spread the word about your brand. The length of the ball chain is 4" and poly bagging is recommended to minimize scuffing. This affordable golf gift makes a perfect giveaway for tradeshows, golf outings, tournaments and more! Size: 1 1/2 " x 2 1/4 "